This study explores the gender relations of Dutch-Filipino couples in the Netherlands. 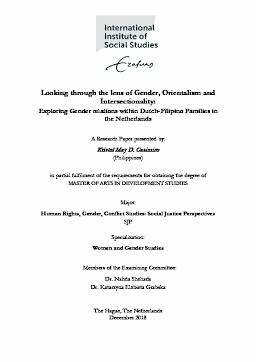 Studying gender relations involves complexities, thus, this research unveils how gender relations are practiced, observed, and narrated among Dutch Filipino couples. Dutch men and Filipino women are not homogenous groups; hence, gender relations are subject to intersectional influences. Specifically, this research investigates how the intersection of gender, socio-demographic conditions, age, marriage, and education contribute to the formation of social relations of gender among Dutch-Filipino couples. Moreover, this study demonstrates how the relationship of Dutch-Filipino couples is historically situated in the relationship between the Orient and the Occident. This relationship is reflected in how Dutch men and Filipino women perceive each other. More importantly, these perceptions have long existed as part of the different notions of the Occident about the Orient. Dutch men and Filipino women carry different backgrounds influenced by various gender norms and ideologies. Bringing them together, two different forms of gender ideologies co-exist such as the gender relations of dominance and subordination. These gender relations undergone are observed in the way Dutch-Filipino couples negotiate and compromise in their everyday life, perform gender roles, and resolve their marital differences.